I took advantage of spring weather yesterday to take a walk up a local mountain. 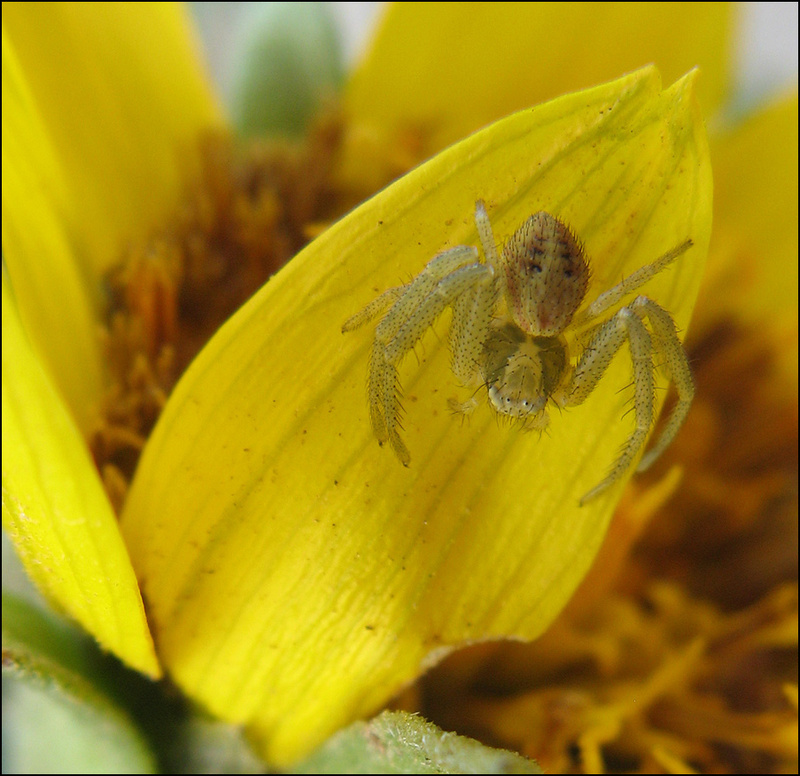 Happened to see this nice little spider hanging out on a balsamroot flower. Shot using Canon A710IS compact digital in macro mode, no added optics, auto-everything. Focus refined using the "SLOP" method (Shoot Lots, Obsessively Prune) -- this was the only one of 13 shots that had focus just where I wanted it. Camera data in the original file says f/4.0, 1/80 second. I am photographing local species (in the east) and having a tough time identifying them; maybe 10% success rate. Could be, but just in case other people are reading this thread, I'll point out once again that identifying anything from a picture is fraught with difficulty. Awesome! I see you're doing a lot of work. I haven't heard from Kevin about the proposal though. I just moved everything out of lepida into the new "celer-importuna-lepida complex" you must have created. The lepida group is empty now, so you can delete it. Thank you! I agree that it is a bit of a mess. If it helps, the only determination labels that I have ever dropped in Mecaphesa vials are for asperata, celer, and dubia. I'm also finding myself dubious of some of Allen Dean's Mecaphesa ID's, so I'm not trusting them. I need to compare my specimens directly with specimen's ID'd by Dondale, Redner, Schick, and Gertsch. On my computer, I am keeping a group of specimens under a directory named "Mecaphesa nr lepida." You have two of those specimens under Mecaphesa lepida on Bugguide. However, I see apparent differences with the lepida descriptions, so I'm reluctant to declare them to be M. lepida just yet. In other words, to my eye classification of this group seems to be a mess that not even the people with specimens in hand can agree about. NU, is there something about this specimen in particular that would mark it as definitely being lepida, whatever that is? Thanks for the pointer, in any case. 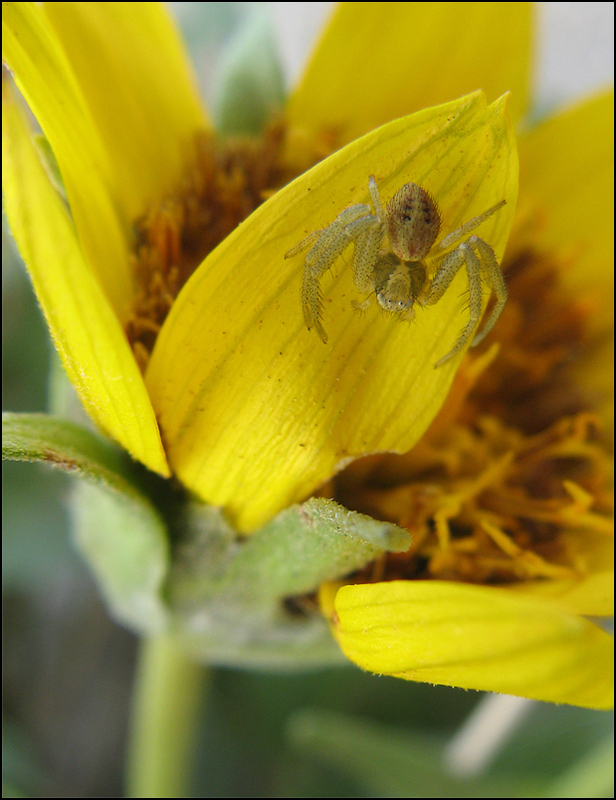 I would have had not much idea beyond "crab spider". Like the way that the spider appears to be looking up at you (and probably is) nice detail too. All this is way over my head and I have only recently warmed up to Jumping spiders, whatever the moniker placed on them. Thanks, Ken. Yeah, it's difficult to imagine that the spider wasn't paying quite a bit of attention to me. That camera will focus closer than 1 inch working distance and I know I exceeded its limit a couple of times. But the spider was a remarkably placid little critter. It never did move more than shift its legs a bit. As for naming, it turns out the spider was actually the second of two dicey situations on that hike. Earlier in the day I had found a bunch of black caterpillars in the top of a green rabbitbush plant. I took a couple of record photos and figured I'd look them up when I got home. That was simple enough. I found them in Dave Nunnallee's "Life Histories of Cascadia Butterflies". They were Chlosyne acastus, seemed like no doubt about the ID based on location, foodplant, date, habit, and appearance. But then when I looked in Bob Pyle's "Butterflies of Cascadia" to see more pictures of adults of Chlosyne acastus, I saw a range map limited to SE Oregon, nothing in Washington, and the comment that "Putative eastern Washington records represent light-colored individuals of C. palla sterope. Back to Life Histories, read some more, found the comment that "The C. palla - C. acastus complex is still poorly understood..."
So then I wrote off to Dave to get current info. His reply: "Chlosyne palla sterope is the old name for Chlosyne acastus (Sagebrush Checkerspot) – same thing. Chlosyne palla (Northern Checkerspot) is now considered specifically distinct, but this was unclear when Bob Pyle’s book was published. It was long recognized that there were two separable populations, but C. acastus was raised to species status only fairly recently." So there we go -- another problem with naming -- except with the caterpillars we knew exactly what they were, just not what they were called this week. ...we knew exactly what they were, just not what they were called this week. Seems to be the case for a number of things I am finding out. It's commendable that you are at least going to the effort of tracking down the names and not simply leaving it at "crab spider" or "caterpillar". The extra effort is much appreciated I'm sure for others. Your SLOP method seems to be working just fine. Now that the weather's cooperating you'll be getting the big guns out soon?